Clarus is a fast-growth property services company that provides contract cleaning and maintenance to commercial and residential clients. Clarus commenced 6 years ago by offering a fresh, dynamic attitude to contract cleaning services. Clarus is a preferred services supplier to global and national real estate asset management companies, Fortune 500 companies and leading national companies. 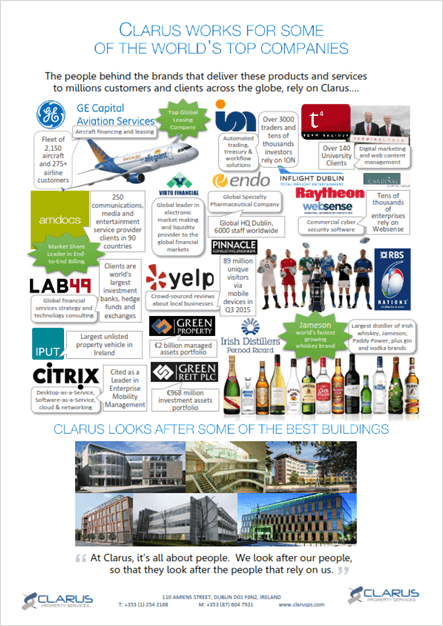 Clarus cleans the offices of some of the world’s top companies. The people behind the brands that deliver these products and services to millions of customers and customers across the globe, rely on Clarus to ensure their offices are clean, hygienic and safe. We understand the importance of meeting demanding cleaning needs within a specific budget and timeframe. We deliver a broad-based customised quality cleaning service that can be personalized to suit each client’s distinctive requirements. We believe in preparation and prevention with regards to maintenance and understand the daily needs of a job or organisation that requires high or low maintenance and planning ahead for any eventuality. The level of planned maintenance is tailored to the specific needs of our clients across a broad range of sectors. Our reactive maintenance is Clarus providing a rapid response for our clients 24/7. Our team is on hand to deal with client specific requirements on maintenance.